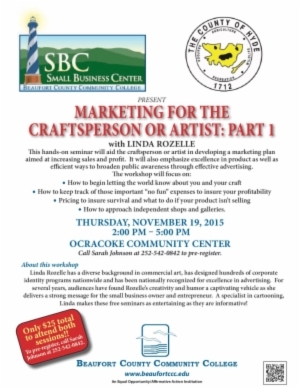 8/11/15 Beaufort County Community College and the Hyde County Office of Economic Development will host two November workshops on Ocracoke focused on Marketing for the Craftsperson or Artist. Workshop leader, Linda Rozelle, has extensive experience in branding, marketing and advertising. She has a love for small businesses and craft artisans specifically. These hands-on workshops will stress creating unique advertising and marketing materials on a budget as well as effective product pricing and how to gain exposure through independent galleries or shops. You will certainly want to go to both sessions, as Mrs. Rozelle will personally provide feedback on your own marketing during the second session! Both workshops will take place on Ocracoke Island at the Ocracoke Community Center, 999 Irvin Garrish Hwy. Session I will be Thursday, November 19, 2015 from 2:00-5:00 p.m. and Session II will be Friday, November 20, 2015 from 9:00 a.m. - 12:00 p.m. noon.